Medieval Romance Novel Sale – Angel’s Assassin for only $0.99 cents! Angel’s Assassin – a medieval romance novel by Laurel O’Donnell – is now on sale for only $0.99 cents! Author jackPosted on January 5, 2014 October 19, 2014 Categories Angel's Assassin, Medieval Romances, Special OffersTags angel's assassin, book sale, laurel o'donnell, medieval romanceLeave a comment on Medieval Romance Novel Sale – Angel’s Assassin for only $0.99 cents! 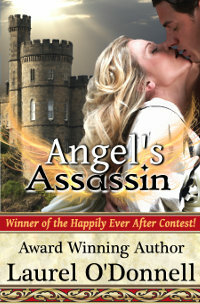 Angel’s Assassin is a medieval romance novel by award winning author Laurel O’Donnell. If you like your romance heroes to be dark and troubled souls, then Damien the assassin is going to be right up your alley! Come and join the Angel’s Assassin Virtual Book Tour! 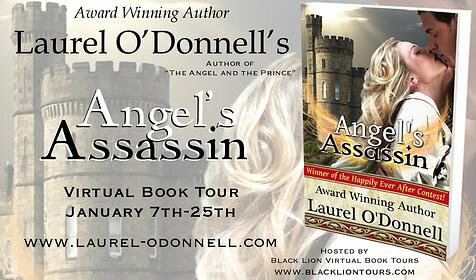 Black Lion Virtual Book Tours is hosting a virtual book tour for Angel’s Assassin from January 7 thru January 25, 2013. You can find the full list of scheduled stops by following the link above, or by clicking on the graphic. Angel’s Assassin is a medieval romance novel written by award winning author Laurel O’Donnell. Angel’s Assassin is going on tour. Visit Black Lion Virtual Tours and follow along! The virtual tour starts in full swing in 2013. To celebrate the launch of our new ODONNELL BOOKS ebookstore, we are offering everyone a chance to save 50% on the PDF version of Angel’s Assassin! Add Angel’s Assassin to your cart and use coupon code Assassin50 to save 50%. This special offer good through December 16, 2012. PDF version only. Offer good ONLY here on the ODONNELL BOOKS website. Watch this space for more special offers and coupon deals from ODONNELL BOOKS throughout the holiday season!